For the American composer, see Walter Piston. For the use of the term in optics, see piston (optics). In general, a piston is a lubricated sliding shaft that fits tightly inside the opening of a cylinder. 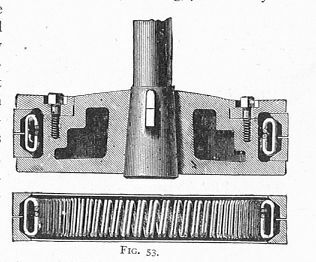 Its purpose is to change the volume enclosed by the cylinder, to exert a force on a fluid inside the cylinder, to cover and uncover ports, or some combination of these. A rubber seal is sometimes used to keep the lubricate within the shaft. Due to the constant motion of the machine this seal wears quickly and should be replaced with every servicing. If the seal should break during usage there can be disastrous long lasting consequences for the machine. There are two ways that a piston engine can transform combustion into motive power. These are two-stroke and four-stroke. A single cylinder two-stroke engine produces power every crankshaft revolution, while a single cylinder four-stroke engine produces power once every two revolutions. Older designs of small two-stroke engines produced more pollution than four stroke engines. However, modern two-stroke designs, like the Vespa ET2 Injection utilise fuel-injection and are as clean as four-strokes. Large diesel two-stroke engines, as used in ships and locomotives, have always used fuel injection and produce low emissions. One of the biggest internal combustion engines in the world, the Wärtsilä-Sulzer RTA96-C is a two-stroke; it is bigger than most two-story houses, has pistons nearly 1 metre in diameter and is one of the most efficient mobile engines in existence. In theory, a four stroke engine has to be larger than a two stroke engine to produce an equivalent amount of power. Two stroke engines are becoming less common in developed countries these days, mainly due to manufacturer reluctance to invest in reducing two-stroke emissions. Traditionally, two stroke engines were reputed to need more maintenance. Even though the simplest two stroke engines have fewer moving parts, they could wear out faster than four stroke engines. However fuel-injected two-strokes achieve better engine lubrication, and cooling and reliability should improve considerably. A steam engine is another type of piston engine. 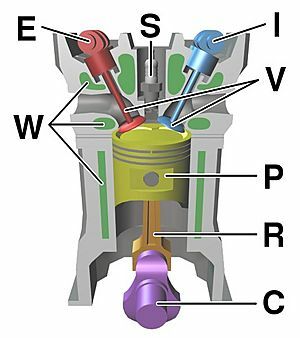 In most steam engines, the pistons are double acting: steam is alternately admitted to either end of the cylinder, so that every piston stroke produces power. Piston Facts for Kids. Kiddle Encyclopedia.